Trailhead and parking area area on Rt. 3 in Lincoln, NH. It is 0.5 miles north of Rt. 93 at exit 34A and just north of The Flume Gorge, on the east side of the road. 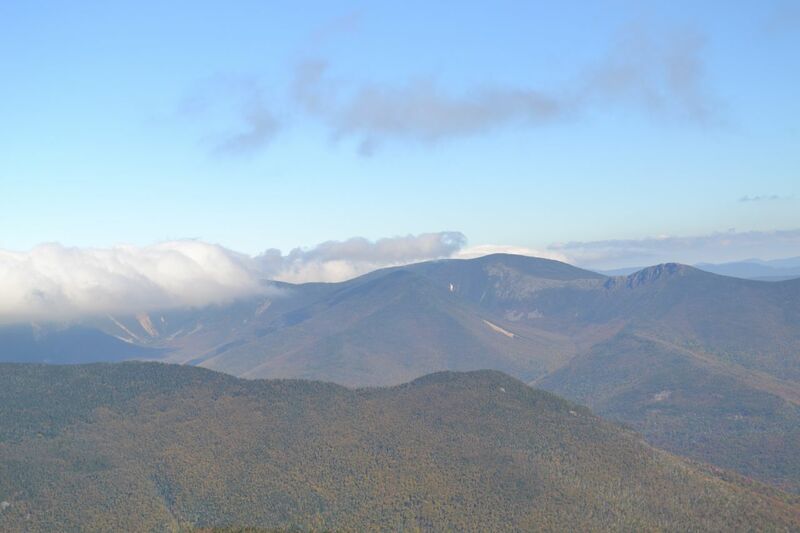 The high peaks of the Franconia Range have long been famous for their breathtaking views of the Pemigewasset Wilderness and are proportionately popular, but the two mountains at the low end of the range, Mt. Liberty and Mt. Flume, are far less visited. Their views are nearly the same, but Mt. Flume's view is restricted by trees in one direction. For this reason, regular hikers will probably want to ascend only Mt. Liberty. 4000-footer climbers will need to get to Mt. Flume. To include Mt. Flume and Mt. Liberty in one trip, you can ascend the infamous Flume Slide Trail. This trail ascends over the path of one of the mountain's old landslides and involves much rock scrambling of great difficultly. This trail should only be attempted by experienced hikers, and you should never descend this trail. Since there is no parking at the beginning of the Liberty Spring Trail, the hike starts on the Whitehouse Trail, an easy path running parallel to the road. Leaving the parking area, the trail climbs around a few small hills for 0.6 miles, then joins Franconia Notch Recreation Path (turn left) for a pleasant stroll along the Pemigewasset River. Just after Cascade Brook Trail leads off to the left, the bike path turns right to cross a bridge. On the other side, turn right onto Liberty Spring Trail. The trail heads straight into the forest for a short distance, then two long, moderate switchbacks lead to the junction with the Flume Slide Trail, 0.6 miles from the bike path. Turn right and follow Flume Slide Trail as it heads off across the slope at a flat grade, occasionally descending. In 0.3 miles, the trail crosses two brooks. It now climbs gradually through an open forest, crossing many more brooks along the way. After almost two miles of winding through the woods and crossing streams, the trail arrives at a larger brook, Flume Brook. This brook is the source of Avalanche Falls, a popular tourist attraction at the Flume Gorge. The trail crosses it twice (difficult in high water), then continues up along the bank, where you can glimpse Mt. Flume and Mt. Liberty above. The trail then crosses the north fork of the brook, the last water crossing, and climbs away. The trail surface changes to gravel as it nears the slide, and the incline steepens rapidly. Soon, you will reach the bottom of the slide. For the next half mile, the trail ascends extremely steep rock slabs, which are often wet and slippery. Good foot placement and use of hands is necessary. Blazes are few, but the route is usually obvious. Some of the trickiest scrambles can be avoided by staying toward the forest on the sides (usually the left side is best). Halfway up, look for a limited view of Mt. Moosilauke behind you. Near the end, the grade lessens. At the top of the slide, the trail turns sharply left and continues to climb very steeply through the forest for 0.2 miles to a trail junction. Turn left onto Franconia Ridge Trail as it climbs much more easily for 0.1 miles to the sharp summit of Mt. Flume. From the summit, the view is best to the south and west. You can see Mt. Moosilauke to the southwest and the Kinsmans across Franconia Notch to the west. Mt. Liberty and the Franconia Ridge rise above you to the north. Mt. Garfield is directly north, over the valley. Owl's Head Mountain and the Twin Range are visible through the trees to the northeast. Mts. Carrigain and Hancock are seen through the trees to the east. To the southeast, you can see Mts. Osceola and Tecumseh over the trees. To the south, the view extends into the distance. Since you should not return the way you came, follow the Franconia Ridge Trail to Mt. Liberty. The trail descends moderately from the summit into a wide col, then makes a steeper ascent to Mt. Liberty with some climbing over rocks near the end. It is 1.1 miles from Flume to Liberty. On the summit, you have unrestricted views in all directions. To the west, you can see the Kinsman Range across the notch, with the town of Lincoln below. To the north, the magnificent Cannon Cliffs rise across the notch from Agony Ridge. To the north, the ridgeline leads up to Little Haystack Mountain and Mt. Lincoln (Lafayette is hidden). On the other side of the Franconias is Mt. Garfield. Past Mt. Garfield, the Garfield Ridge leads past small, rounded Galehead Mountain up to the Twins. To the south down the Twin Range is Mt. Guyot, followed by Mt. Bond (with West Bond in front), then the magnificent Bondcliff. Then the long, wooded Owl's Head Mountain stretches out below. In the distance, beyond the Bonds, is Mt. Washington. In the distance to the right of Bondcliff are mountains in the Baldface Range and on the lower Montalban Ridge. To the southeast are Mts. Carrigain and Hancock. Right in front of you is Mt. Flume, with its dramatic slides best visible from this angle. Behind Flume are the Sandwich Range and the mountains around Waterville Valley. To the south, the view extends a great distance. Off to the southwest is massive Mt. Moosilauke, across Kinsman Notch from the Kinsman Range. With the rising Franconia Ridge in view ahead, continue on the trail as it drops off the craggy summit and takes you past the huge rock wall that makes Liberty's summit so distinctive from afar. The trail drops down into the forest and leads down on the gentle ridge crest for 0.3 miles to the junction with Liberty Spring Trail. Turn left onto this trail. Follow it as it drops off the ridge and soon becomes a typical steep and rocky White Mountain trail. In 0.3 miles, the trail passes through the Liberty Spring Campsite. For the next 1.1 miles, the trail descends at an unwavering pace, with occasional turns. After dropping 1800' from the top of the ridge, the trail swings to the right and finally begins to flatten out as it cuts across the hillside. In another 0.3 miles, it crosses a sizable brook and then continues at an easy grade for the final half mile to where you first turned off for the Flume Slide Trail.